It’s an honest fact that Halibut are one of my favorite fish to catch (and not just because they taste so good). 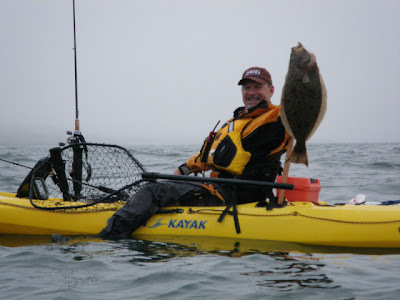 Halibut are solid fighters and when you finally get them to the kayak, well, that’s when the real fun starts. They have a real nice set of chompers and they love to snap at you sometimes when you’re trying to make the transition from the net or gaff to the game clip. And then, just when you think all is well on the home front, they can go ballistic out of nowhere and scare the bejesus out of you. Halibut meat is light and flaky and tends to cook fast. Keeping a close eye on the cooking process will enable you to make sure that you don’t overcook this delicate flesh. If you do, it’s still not bad. But of course, it’s always better a bit on the moist side. Personally, I’m not a fan for a bunch of sauces or flavorings on the fish because it’s mild flavor.Poached or grilled with just a bit of butter is my cup of tea. The San Francisco North Bay has some excellent spots for halibut. I don’t fish much in the South Bay so I can’t offer too much advice on that, but a quick peruse of the NCKA forums will give you plenty of recommendations. My favorite spots include the Alameda Rock Wall, Paradise Park, Muir Beach, Tomales Bay and Bean Hollow State Park. I’ve fished for these flat-faced flounders with both live bait and soft plastics. I know some people swear by frozen bait but that’s just never worked too well for me. For live bait I’ve used Shiner perch, Sardines, Anchovies, Smelt and Mackerel. Live shiners can be bought at the Loch Lomond bait shack in San Rafael or Mike’s Bait in Oakland. I go to Mike’s when I’m in the east bay and Loch Lomond when I fish Paradise or Muir. In the warmer months you can also catch your own live bait in San Fransisco and Tomales Bays. Two years ago there was so much bait in Tomales Bay that we couldn’t stop fishing for Sardines and Mackerel because they were too fun to catch. Use a sabiki rig size number 8 or 10 with a small weight on the bottom on a light rod and when all the hooks load up with fish it’s crazy fun. Be sure to check the Fish and Game regulations for the areas you fish for live bait as the number of hooks you can use are different according to specific areas. The best tides to use are the lesser tides that have the least amount of movement when fishing in the bays. Me, I like fishing an incoming tide.In the ocean I also like to fish through the top of the tide as the water is a bit clearer giving the bait a better presentation to the fish. There are a few different ways to fish with your live bait. One is to use a three-way swivel. One eye of the swivel is connected to your mainline. One is connected to your leader. The last eye of the swivel is connected to a dropper line that has your weight attached to it. The length of the dropper is regulated by how fast you are drifting/trolling or the length of your leader. You always need to keep the bait just off the bottom so it does not foul in the mud or pick up debris (honestly, what self-respecting halibut wants to eat muddy bait? )Longer the leader, longer the dropper line. You want the weight to just tic the bottom every so often. If you are drifting too fast and the weight isn’t touching, try increasing the weight amount. In cloudy or stained water you can use a shorter leader and longer with better clarity. The other way I like to fish live bait is on what’s called a Carolina rig.Above the end of your mainline I use a barrel weight with a red bead below it then tie a swivel at the end of the line. I use 20 lb. mainline so usually a 1-2 oz weight is enough. Then I tie a 36 inch leader of 25-30lb. test line. I use a 1/0 or a 2/0 Mutu light circle hook. With the larger baits I tie what’s called a stinger to the main hook to put in the tail of the baitfish so as not to miss short strikes from the halibut. In that case I snell knot the circle hook to the leader then with the tag end tie on a #4 2x treble in black finish. If you have sonar on your kayak look for small drop-offs. Halibut I think for the most part are lurking predators that lie–in-wait for food. As you drift over the bottom they will race to the bait. Sometimes the bite is soft and other times they will hammer the bait violently. On soft bites, sometimes you can put your reel in free spool and sort of feed the bait till the rod tip loads up. Then lift the rod and it’s on. Don’t set the drag too tight. Let these fish run and get tired because YOU ARE going to have an experience when the fish gets to the kayak. I prefer using a net. Others swear by the gaff. I have yet to use a gaff in the kayak but I’m waiting for the day a halibut I’ve hooked will be too large for the net and I’ll go to the gaff. During the fight have your game clip at the ready to put through the gills and your club also ready for the knockout punch. After your fish is clipped always bleed out the fish by cutting the gills on both sides. It’s always best to bleed the fish for a better quality to the meat. Always remember to stay within your level of water experience when fishing on the bay or in the ocean. Always have a buddy with you. Carry a radio and other safety equipment. A PFD (lifevest) is a must. Always, always dress for immersion. A short time in the water can lead to disaster and it has happened to even the best.There’s nothing like a little hypothermia to ruin an otherwise great day on the water. Here’s a few of my favorite launches for fishing halibut:At the Alameda Rock Wall there’s a launch right next to Encinal High School with – no fee. Paradise Park, Marin County – $8 day use fee. I prefer to buy the annual park pass for Marin County as you can go a lot of places with this pass and save some dough for your bait. Miller Park (aka Nick’s Cove) in Tomales Bay is a great place to launch. Same fee as Paradise and the Marin County park pass is good here also.From here you can fish the other side of Hog Island, Pelican Point and the flats in front of Marshall for halibut. Well that’s a pretty brief tutorial on halibut fishing. Go out and try it. 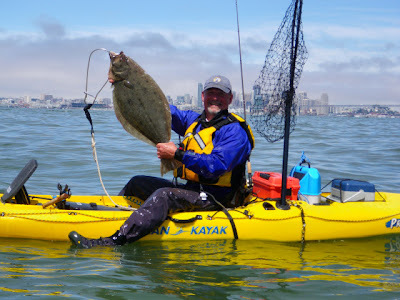 Pull your first flatty onto your kayak and the halibut won’t be the only thing that’s hooked. 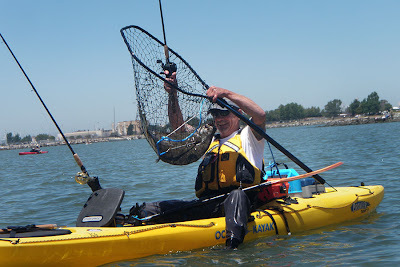 You can also go to www.norcalkayakanglers.com for information and to meet other kayak fisher people. It’s a great place to enter the world of kayak fishing and meet new friends. Please feel free to E-mail me for questions or comment at ravensblack52@yahoo.com. Have a great day and FISH ON!-Craig. Craig Davis is the latest proud addition to the Ocean Kayak Fishing Team here in Northern California. Two to three days a week he’s on his Trident 15 teaching those fish a lesson in humility.